Jurassic: The Hunted is an epic, story-driven first-person shooter set on a dark mysterious island that connects the modern world with the age of dinosaurs. Players take on the role of Craig Dylan, a weapons and survival expert, hired to protect a research team sent to study the strange temporal energy of the island and recover whatever is left of the expedition lost on the island 25 years ago. Every minute is a fight for survival as Dylan must scavenge weapons, defend barricades, and battle titanic dinosaurs to return to his own time. 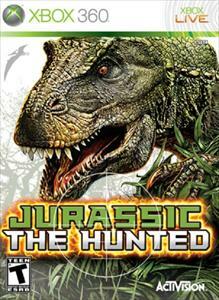 (Online Interactions Not Rated by the ESRB) Jurassic: The Hunted is an epic, story-driven first-person shooter set on a dark, mysterious island that connects the modern world with the age of dinosaurs. Players take on the role of Craig Dylan, a weapons and survival expert, hired to protect a research team sent to study the strange temporal energy of the island and recover whatever is left of the expedition lost on the island over twenty years earlier. Every minute is a fight for survival as Dylan must scavenge weapons, defend barricades, and battle titanic dinosaurs to return to his own time.